Last month, I recommended The Handmaid's Tale as one of my top picks for a Women's History Month listenable, and it turns out that it's actually the focus of this month's Audible Ambassadors post! The timing is not completely unexpected, of course, since the Hulu adaptation is premiering later this month (and yes, I am very eager for it. Might actually have to sign up for Hulu again. Or maybe I'm due for a free trial. . . ;P). 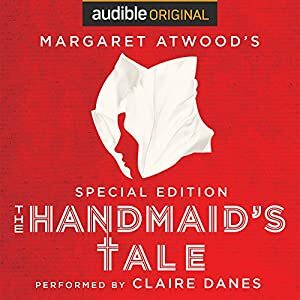 Whether in conjunction with this, or in some strange cosmic timing because the book is still so eerily relevant (maybe now more than ever), Audible has reissued a remastered and redeveloped special edition of the audiobook, narrated by the fabulous Claire Danes, which includes new exclusive content written by Atwood at the end of the novel! The novel extends beyond the original final line, “Are there any questions?,” by adding the questions and answers that the people at that Symposium, occurring in 2195, might ask. This is pretty significant stuff, if you ask me. That ambiguous, open-ended ending haunted me when I first read it, and I often use it as a sort of litmus test for whether someone is an optimist or pessimist. . . As it turns out, I'm a can't-make-up-my-mindest, because I go back and forth quite a bit on what I think really happened -- but before I get to spoiling things, maybe you have never heard of this landmark book, and have no idea what I'm talking about. And trust me, it's a book you want to read. Or listen to. But I'd definitely like to put in a good word for this one. It's one of my favorite books, by one of my favorite authors, narrated by an amazingly talented actress, and has special bonus content -- you just can't beat that. This is a sponsored conversation written by me on behalf of Audible. The opinions and text are all mine. Comments submitted may be displayed on other websites owned by the sponsoring brand.